I am writing this blog entry in a hotel lobby. I did a funeral for a family member today and I am returning home via the friendly (yet highly paranoid) skies tomorrow. By the way, the recording that repeats every ten minutes at the airport reminds us that the terror alert is orange--so be sure to keep your liquids in a resealable sandwich baggie, turn in that suspicious looking dude who just put his luggage down in order to pee, and do wear your rapture bloomers. I have been reading two books while flying. One while I am in the airplane itself and another while enjoying those three hour layovers between flights. 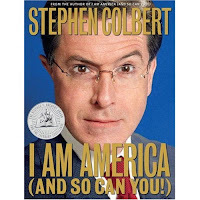 The on-flight book is the latest from Stephen Colbert (who recently announced his candidacy for president). I need some light reading on the plane. I caught myself laughing out loud more than once. While on land, heavier reading is in order. The View from the Center of the Universe: Discovering Our Extraordinary Place in the Cosmos. This book provides an overview of what science knows about the universe and it takes the second step to offer symbols of how human beings can understand our significance within this story. I am going to write more about it on future blogs. For now, it is enough for me to say that this kind of work is what I have been trying to get at in my feeble attempts at a theology for the 21st century. What I personally find as I read this is a sense of hopefulness for humanity. More specifics on the way! I am enjoying reading "The View from the Center" too. I wonder if you have considered John, that some of the scientism espoused in this book is a form of modern "myth" itself? The Scientist as Philosopher: Philosophical Consequences of Great Scientific Discoveries. I would highly recomend you read this John as a balance to "The view from the Center." Otherwise, one might be replacign one myth with another, i.e., that scientific knowledge is the only means for obtaining a knoweldge of truth. I didn't get that feeling (scientism) at all from reading A View From the Center. I found the book hopeful and promising. Yes, it is about new myths, precisely a new way of mythologizing about ourselves in the cosmos science is uncovering for us. I will check out the Weinert book! Ah, I wondered where you went. Good to know you'll be back in town soon. I daw the bit on the Colbert Report with Dennis Kucinich. Great stuff; makes me want to get that book. Anyway, welcome back to NETN. The fall colors are awesome, and you might still get to see a bit of it before the leaves do a 3-1/2 twist with a forward tuck. Don't misunderstand. I think there is value in this book, but we should appropriate new "myths" with a self-critical attitude I think. I will provide some very specific examples of why I argue they are engaging in a form of scientism in that they are making loose claims in the name of science that are Metaphysical Cosmology. 2. Prematurity in Scientific Discovery. 3. The Scientist as Philosopher. When scientists make "philophical and theological claims cloaked in scientific rhetoric" is behooves scientists, philosophers, and religionists to apply the same self-corrective critical philosophy that science is forcing outdated religious belief systems to undergo, less, as I assert, we replace one myth for another. Render to science those questions that science rightfully can answer; to philosophy those questions that philosophy rightfully can answer--informed by both science and spiritual insight; and to God those questions that only God, through living faith and spiritual insight can answer. I don't disagree with anything you said in principle. I am interested in the specifics about this book. Thanks for the links and the comments! John, I'm sorry to hear about your family member. I've got you and yours in my thoughts and prayers. The Colbert book was a scream. DOMINATE ALL ANIMALS (except his dog Gipper, who is very sensitive).